Your medicine cabinet and kitchen pantry will probably look very different after you devour this comprehensive, updated guide to nutrition therapy. 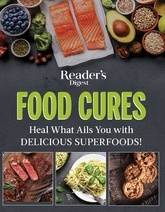 The foods described in this book are nutritional powerhouses bursting with compounds that have specific and well-defined health benefits. Research-validated treatments and successful cures from the last decade address 56 health complaints, from allergies to insulin resistance to yeast infections. Samuel Parker is the author of Purgatory Road, named one of Library Journal's Best Books of 2017, and Coldwater. Born in Michigan, he was raised on a never-ending road trip through the US.